For March break, we decided to take our two youngest children(13 & 14) away for a few days skiing & snow-boarding. I ski; they board. I knit; they get bored - It's hard to keep everyone happy. Anyway, so as not to be too "boring", I decided to take a mindless project with me. Then I could still be part of the family arguments - as in- 1. You can't watch THAT music video. 2. What do mean, you left your only pair of mitts at school? 3. When exactly in the last 24 hours did you stop liking frozen pizza? ...it goes on..and on.. 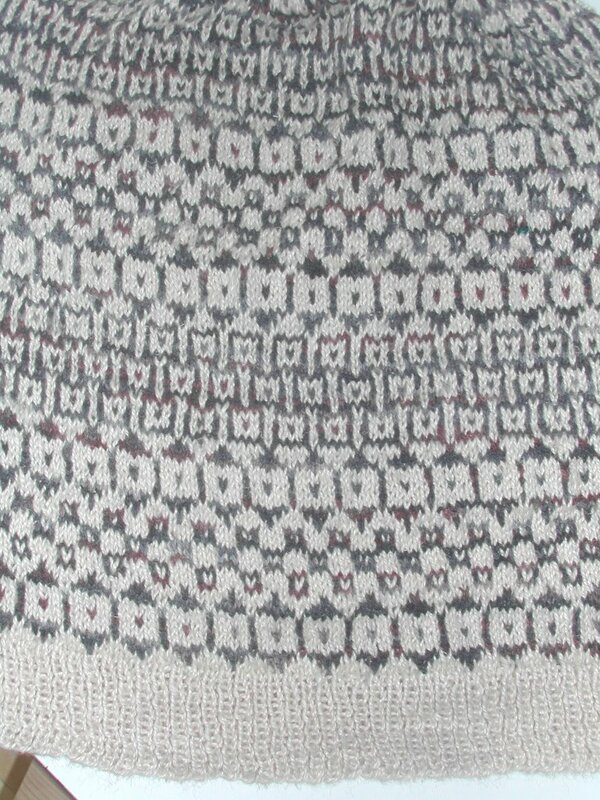 I knew that there was an unfinished - really just begun fair isle in the closet. I had started it a while ago for my husband -it would certainly make him happy, if I finished it. I can't even remember now why I had stopped knitting it. 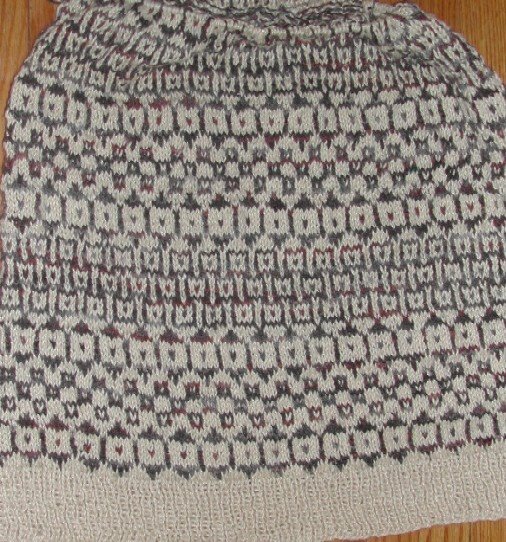 However, finishing it would not be quite that easy, because I had forgotten to take enough yarn home from Infiknit for the whole sweater and then went and sold all the remaining yarn - cream hemp and wool - that I needed to finish the sweater. I never seem to get this thing called "organization" right! However, I also knew that there was another sweater in the closet. This one was almost finished. It really just had a half a sleeve to go and it too was in cream hemp and wool. 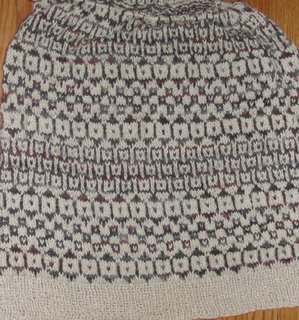 I didn't finish it because, I had decided that the armhole opening was too small for the rest of the "look" of the sweater. Well I tried it on for a second opinion. 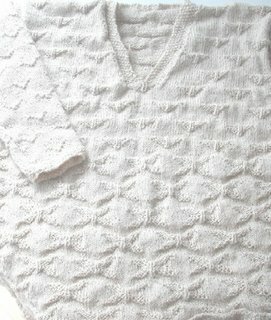 The armhole depth was fine now, but the whole sweater was too big. I had actually lost weight in the last year! WOW! I was down to the wire now, though as far as decisions on knitting projects were concerned. The car was packed. The kids on board and I was holding everything up. 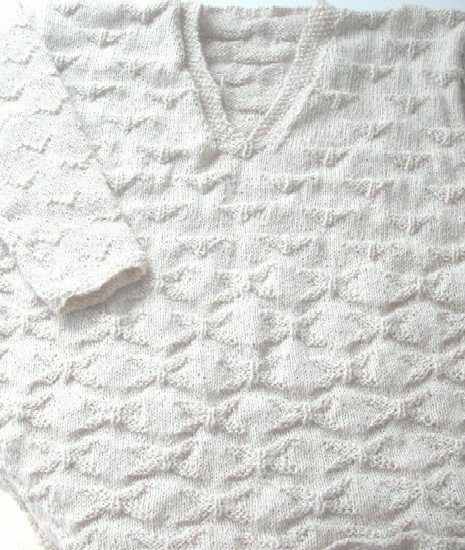 I grabbed both sweaters all the bits of yarn and needles I needed and decided to sacrifice one sweater for the other (the cream nearly finished one for the just begun fair isle) My husband would get the standard crew neck pullover - his favourite and I would settle for an oversized cropped vest! End of story accept that now I have to finish both projects before I make another mistake with yarn and lose the Country Silk "mineral" that I am using as the second colour in the fair isle. At top is "Flight" - it will certainly be lighter as a vest and left is "Syncopated Sanquhar". Now to the car, the needles and the slopes!